I questioned a local if he knew how many islands actually exists in Krabi. With a huge smile on his face, he replied, “Many many beautiful ones”. And that set the tone of our entire trip. In my previous post, I had explained how Krabi was entirely planned for us by Bamba Experience. Our first day was all about hopping from one island to the other. We were picked up from our hotel in Krabi Town and reached a pier in Ao Nang. It was a rainy day and Narayanan and I were almost ready to hear the word “trip cancelled” as the seas, at least to our eyes, was pretty rough. However, that was just another normal day for the tour operators and we were ready to island hop. We were taken in speed boats where the guide explained the plan for the day. The boat carried the right number of people and we were given unlimited water bottles and puke bags. Don’t think you won’t need the latter as many used it by the end of the trip. Yes, the waves were pretty rough and I guess that’s what the made our (N & I) hop more exciting. Our first stop was the Bamboo Island. 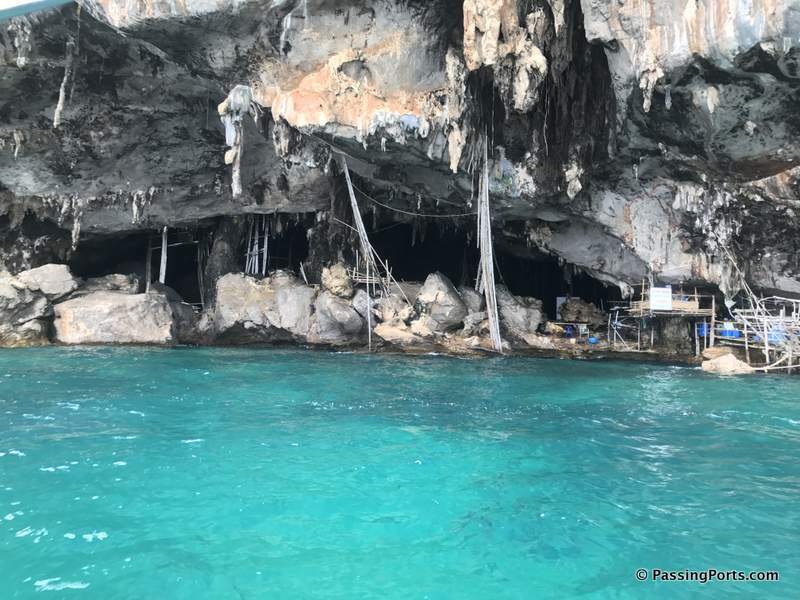 You will, by now, be used to the limestone cliffs of different sizes present in the middle of the sea (and land) as you cruise along the Andaman Sea. About 45 mins into the boat ride, we were given about 30 mins to explore this Island which is a part of Hat Noppharat Thara – Mu Koh Phi Phi National Park. There is a small restaurant and we had veggie fried rice as we were unable to catch up with breakfast. 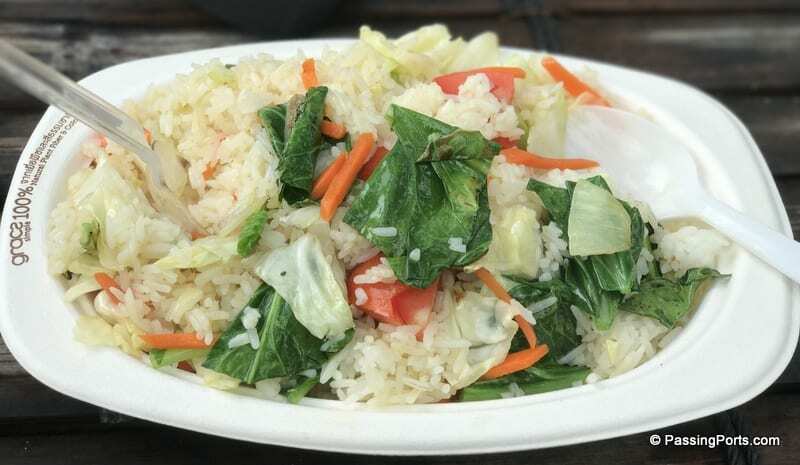 And yes you read it right, VEG fried rice and a yummy one at that! You can swim here, laze around the island, snorkel, take numerous pics and relax. We were one of the early birds to reach this island and it felt like the whole beach was for only a few of us. With prior permission from the Park Rangers, you can even camp here for the night. How awesome is that? 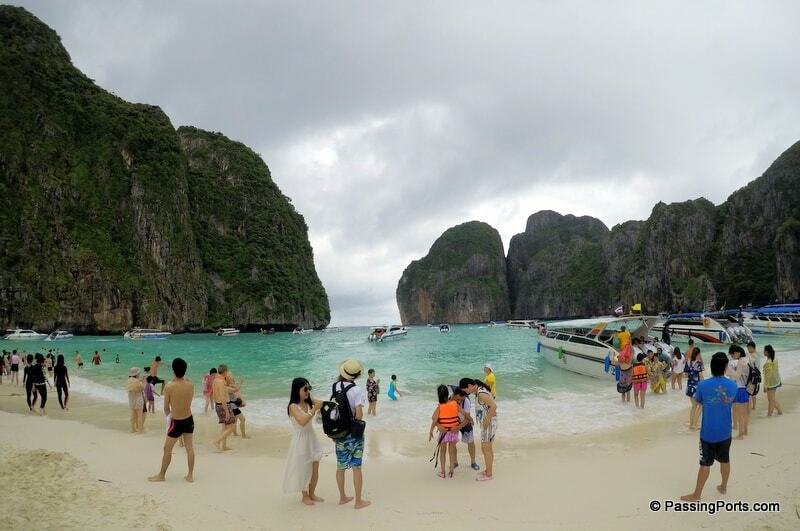 The day was all about visiting the famous places in these islands which in general is referred to as the Phi Phi Islands. 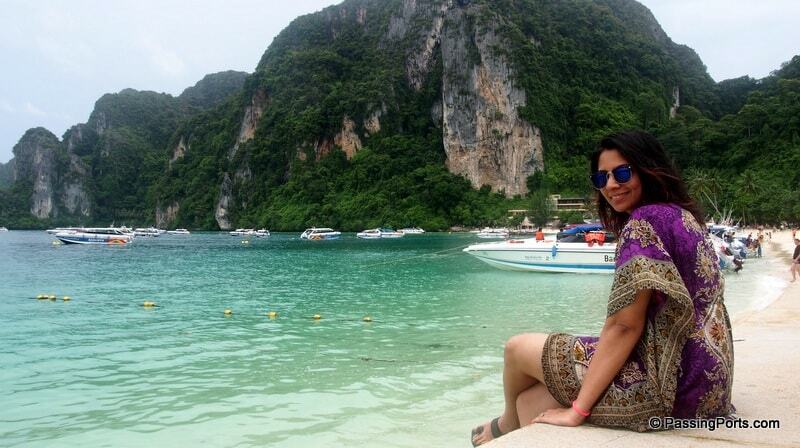 Our next Krabi island hopping stop was at the tip of Phi Phi Leh. The cave is inhabited but tourists are not allowed to enter here. Like most other caves, it has stalactites and stalagmites inside. They stopped here for a minute to let us catch a good glimpse of this place. And the most awaited beach had come. I jumped out of the boat and was so happy to have made it to this beach. After reaching and enjoying the waves for a while, our guide had asked us to visit Loh Sa Ma. Not knowing what this place was about, we walked to the other side just to be awed by it. My love for this beach and island grew multi fold. You can swim, chill, do whatever you please. When we arrived here, the clouds were getting darker and within seconds, we were under a cloud burst. A chilling and beautiful experience nonetheless. An interesting thing that our guide mentioned was how he wanted this beach to be shut and not let tourists visit due to dangerous tides. He did not say anything beyond and just smiled. That smile made me think and I wanted to know the true intention and meaning. I guess I will never know 🙁 Just a reminder: This island was absolutely smashed during the deadly 2004 tsunami. 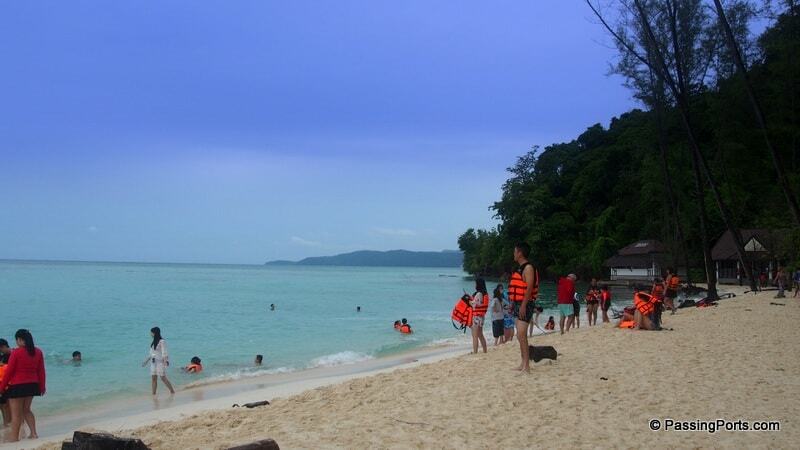 Almost everyone who goes island hopping in Krabi heads to Monkey beach. As the name suggests, one can spot a lot of monkeys here in this small beach. It’s a cute sight, especially for kids, to see them swim, jump around and eat what the other tourists offer. A lot of travellers stay here in this bay as there are many resorts in here. If you look at the map, there is a beach on both sides of this island. We learnt that this island was greatly damaged during the Tsunami. Anyway, we had our lunch here along with so many other travelers. We were given at least an hour or so to spend time on this beach. After we started from here, we were taken to a place just outside Ton Sai to snorkel. I did not snorkel for as long as I wanted to, as the fishes started biting me and I hate that feeling. The rest of the bunch had fun until they were called back. After all this, we returned to the pier – a different side as the water had receded from the place we had earlier began. We were dropped at our hotel in Krabi Town by night. That was the end of our Krabi island hopping. As is the case always, if only we had more time! Seven Island Sunset Tour – starts at about 1200 pm so you late risers can opt for this. Both these two Krabi island hopping tours are also equally awesome is what we have understood and if time permits, don’t miss any. Phra Nang Cave Beach is supposed to be a gorgeous beach while we visited the Railay Beach and loved it. 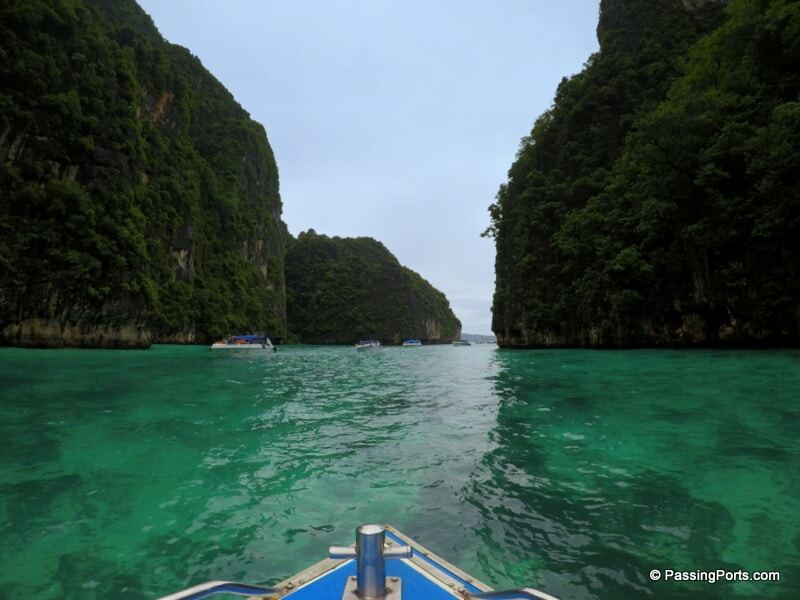 Both these places are not accessible by road and you need to take the longtail boat if you decide to go on your own. Railay Beach is famous for rock climbing and we had our first experience rock climbing here. A beautiful beach and an amazing day that’s very close to my heart, I must say. To conclude, I hope this post gives you an idea of what we did and what you could probably do to chalk that itinerary of yours in Krabi. The James Bond island can be visited from Phuket as it’s closer to that island. 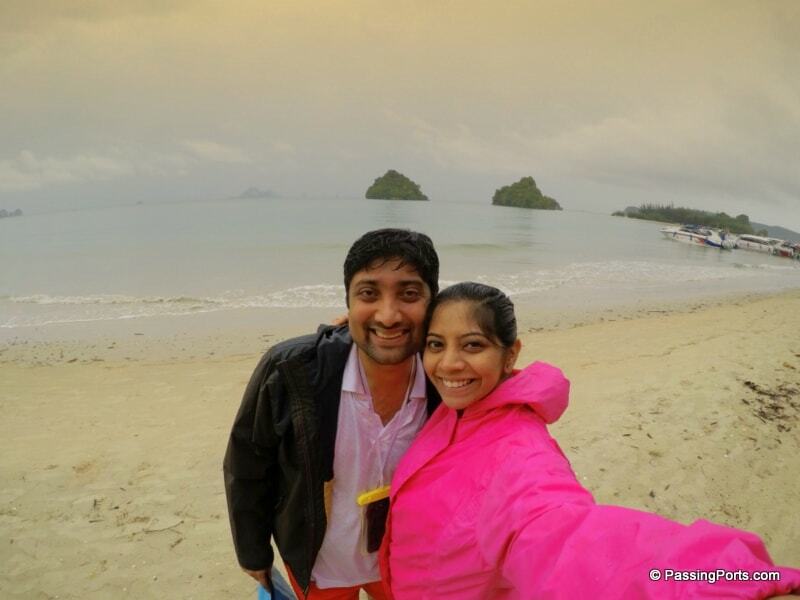 To know how we spent our time in Krabi, check this post! Fall in love with the blues. Happy travelling!